Do you need to move house (or flat)? 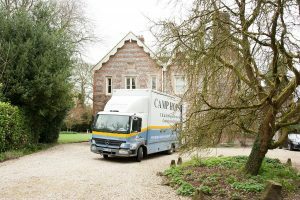 Then you’ll need a dependable removals company in Basingstoke and Camp Hopson is the answer. We’ve been moving people for nearly a century and the result is that we know what we’re doing. Expertise and experience combine to make Camp Hopson moves sleek, efficient and stress-free. We know the area well, so we can get you from A to B along with all your possessions and a minimum of upheaval and disruption. Yes, there are other removal companies in Basingstoke, but we can really deliver. If you thought moving was an exhausting and taxing experience, be prepared for a surprise; it really doesn’t have to be that way. In the right hands, your house-move can be a time of energy and optimism. We’ll take into account the specific requirements of your move and then devise a plan that leaves you free to enjoy life. We also offer a full packing/unpacking service and our packers are trained personnel who know how to look after delicate and valuable items. They can handle complicated objects like pianos and furniture and, where necessary, look after the dismantling and reassembling of goods. On the day of your move, we’ll be there at the agreed time. Our movers and drivers will get everything out of your old home without damaging paintwork, walls or banisters; they’re diligent and careful as they work. They’ll unload everything at the destination and unpack everything (if requested) in the correct room so that you can enjoy your new space right from the first day onwards. When you get in touch with Camp Hopson, we’ll arrange for an estimator to visit you and discuss your move. Then you’ll be supplied with a clear and straightforward quotation. We’ll be ready to start work when you give us the word. Throughout the process, we’re held to BAR (British Association of Removers) standards, so that you’re guaranteed a good service. And if you need storage in Basingstoke (house-moves often result in the need for either short or long-term storage), then you’ll find our safe, secure and clean facilities a godsend.